Tips are the lifeblood of Capitol Hill’s food+drink economy and a proposed $15 an hour minimum wage has put the customary gratuity in the spotlight. Last Thursday the Capitol Hill Community Council devoted its entire April meeting to what a $15 an hour wage would mean for the Hill’s tipped workforce and the neighborhood at large. Business owners, particularly high-end restaurantuers, in Seattle are asking Council and the Mayor to establish a two-tiered wage system based on the earnings of a handful of waiters and waitresses that earn above $15 in tips and wages. 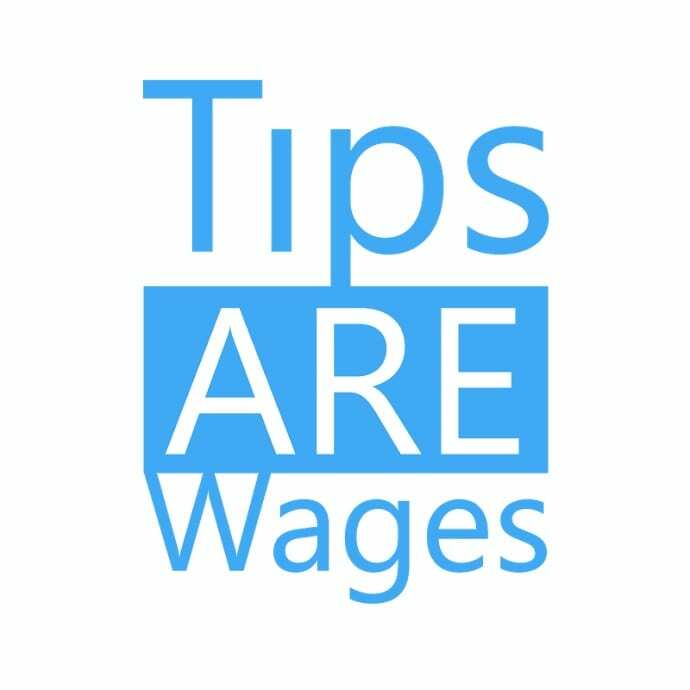 Puget Sound Sage’s new study highlights the reality of tipped work in Seattle, so that the debate can focus on practical solutions for raising the minimum wage instead of speculation about who tipped workers are and how much they make. Six Capitol Hill-centric panelists opened Thursday’s meeting to discuss their views on the minimum wage. Von Trapp’s bartender Bridget Maloney said she was concerned that an immediate $15 an hour minimum wage hike would lead to reduced tips and force layoffs at local independent businesses in a neighborhood where many service industry workers already make over $15 an hour. Council member Kshama Sawant, who spearheaded the fight for $15 an hour, recently proposed a three year phase-in for non-profits and small businesses. However, $15 Now organizing director Jess Spear, who attended last week’s community council meeting, said counting tips and healthcare benefits as wages was a non-starter. Capitol Hill bar owner Andrew Friedman said he agreed with many on the $15 Now side that more should be done to ensure large corporations pay their fair share of taxes and wages. But he said a $15 an hour minimum wage would force him to raise prices 25% at his Capitol Hill establishments, which include Liberty and the soon-to-open Good Citizen. “Not all competition is equal — not all businesses have equalized pricing structures and not all have the same profit margins,” he said. Gregg Holcomb, who opened Broadway’s Witness bar in August, said many on the $15 Now side wrongly assume local business owners are wealthy. He said Witness still has $270,000 of outstanding debt, which will take him seven years to pay off. “I’m just the guy with a condo down the street,” he said. Two recent studies commissioned by the City of Seattle, and recently presented at a Seattle University symposium, showed that raising the minimum wage would be beneficial overall to the local economy. Others have argued that the studies use data that doesn’t accurately depict the constraints on local, independent businesses. Earlier this month $15 Now organizers filed language for a charter amendment with the City Clerk. If enough signatures are gathered an unmitigated $15 an hour minimum wage could be on the ballot later this year. Meanwhile Mayor Ed Murray’s Income Inequality Advisory Committee is expected to release a minimum wage proposal by the end of April. The coming week should be a busy one for Seattle as it pounds out solutions and compromises on raising the minimum wage. The mayor’s task force is slated to hold its final and — Murray hopes — summit-reaching meeting while a Thursday deadline for recommendations looms. Meanwhile, the paperwork has been filed for a charter amendment to pass a $15 wage should City Hall fail to act. Past CHS minimum wage coverage is here. 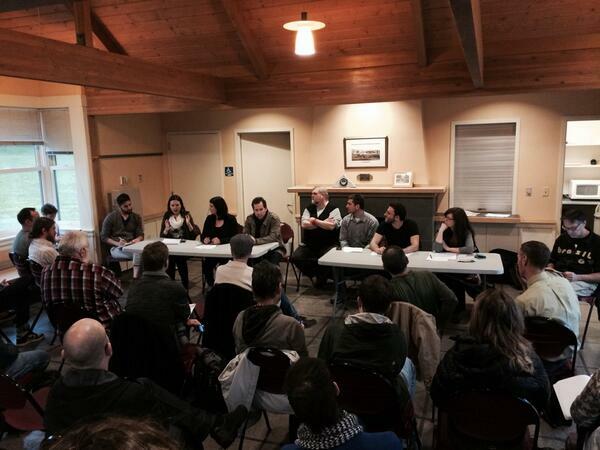 The Capitol Hill Community Council meets monthly at Cal Anderson park. This June the council will be electing new board members, open to anyone in the Capitol Hill community. This entry was posted in News, etc. and tagged community council, minimum wage by Bryan Cohen. Bookmark the permalink. Pay them all 15 and get rid of tips. The funny thing is, the waiters and bartenders will probably make net less if the $15 minimum wage passes. Funny thing is, the waiters and bartenders will probably make MORE if the $15 minimum wage passes. Let’s say we can believe the Liberty owners supposed price increase 25%, 15% of 125 = 18.75, which is more than 15% of 100 ($15, you could have figured that out!). That’s not even including the extra 4-5/hr in wages. Now, let’s say that when prices increase 25%, nobody will stop eating out as much as they do now, because that 25% increase doesn’t seriously impact them. Yeah, let’s just say that. When prices increase 25%*, nobody will stop eating out as much as they do now. Wow, that wasn’t hard. In fact, if more people have expendable income rather than it all going into the business owners’ pockets, people will eat out MORE. You don’t get it….. When the increase takes place restaurants and other small business will reduce staff members or staff members hours, thus leaving the possibility of now all of a sudden one person unemployed and others underemployed. How is the increase going to leave more expendable income in employees pockets when they begin taking home no paycheck, or less hours on that paycheck for that pay period? I apologize for the reference to business owners in the above comment, that was unnecessary, I was a little annoyed by the previous comments when I typed that, and regret it . There is no reason why business owners and employees can’t both make living wages. A small increase in price combined with increased consumer purchasing power should allow most business owners to continue making profits consistent with what they make now. People are not going to stop eating out, and people are not going to stop tipping. Lots of people now make more than $15/hr. Lots of people will not make more $$ w/a $15/hr minimum wage. Lots of these people will eat out less if prices were to go up 25%. You’re assuming the # of people who eat out will increase more than the # who would stop eating out if prices went up 25%? Maybe low-end restaurants, but not the ones where +25% adds a big chunk to the menu prices. Precisely the places that have people tip-dependent. Not even addressing: number of retailers who would have to raise prices or cut personnel. Tons of people who are able would then start to drive top shop outside City of Seattle to nearby cities. Or drive even more to online shopping. If you think these impacts are negligible you’re kidding yourself. You are posting these scenarios as if they are facts, when in reality none of these things have ever happened when the minimum wage has increased in the past. Prices go up a negligible amount, people still want to live eat and shop in the city, and lower income people (especially women, who are more likely to be paid at or near minimum wage) are better able to provide for themselves. I think the “analysis” by Puget Sound Sage is quite suspect. In a recent Seattle Times article, data was shown which says that the overall average pay for a restaurant server, including tips, is $28/hour. Of course, some make less (such as baristas) but if the figure is accurate, then it certainly is not necessary for servers to make any more base wage than the state minimum. And if their wage goes up to $15/hour, and if many people then decide to stop tipping, their income will surely go down. If 15 passes I stop all tipping….that’s the only positive for me about the $15 wage. Definitely. And everyone should be ok with that. It would be inequality for good servers to make more than bad ones. This surprises me. Minimum wage is $9.19/hr, so one has to make $6/hr in tips to get to $15. It seems that most front-of-house staff in a sit-down restaurant would receive far more in tips. > Waitresses represent roughly 61% of Seattle’s tipped workers. And they say that *median* hourly wage (median, not average) for waiters and waitresses is $12.15. In other words, half of servers receive $3 OR LESS per hour in tips. Do people really tip that badly? Or are these folks working lots of hours with almost no customers? I refuse to tip anyone for anything. If you don’t make enuf money, find another job. nice work Bryan – wish we could have chatted for a few but it was packed and I didn’t even see you over in your corner! coffee soon. I don’t think everyone really understands restaurant economics. the current average profit rate is about 4%. that’s BEFORE taxes. that doesn’t mean this goes directly into the owner’s pocket. some of it is saved for future re-investing. re-investing in infrastructure that can create more jobs and grow the restaurant. And it’s not just the minimum wagers that are getting 150% raise. Managers who may already make $15 will also have to be raised up. Most restaurants target their labor at about 30%, and ingredients at about 30% of their sales, and hopefully about 30% goes to overhead…things like rent, utilities insurance, linens, etc. leaving about 10% profit, but then there might be slow months, or suddenly the freezer breaks down. So in the proposed system, not only is the labor going to go up, but so too are the ingredients. And the sales will go down. Oh, and the taxes will go up. But wait, it looks like that might be the goal. CebuAyalaHomes is a Real Estate World-wide-web site that offers houses and land, residential condominium, commercial office space, commercial lots in the Malaysia and also Philippines is every fast becoming the place even people build their homes. Known as a country back home to fine beaches, hospitable people, exquisite cuisine, truly, it is a great deal fir customers to own a property in this country. Of course, one linked with the basic reasons underneath this fact is while of the vibrant exact estate market in ones Philippines. The Philippines is actually home to assist you one of how the cheapest real show place properties. Also, the total estate industry at the same time is a important and vital part of our country’s economy. In this case, no wonder, soon after choose to real estate Belgium.